The communications industry is undergoing a paradigm shift from static connectivity services to dynamic/agile, assured, and orchestrated Third Network services that provide an on-demand experience with user-directed control over service capabilities and cloud connectivity. MEF is driving this transformation by expanding work beyond CE 2.0 (Carrier Ethernet 2.0) to include development of new orchestrated Layer 1-3 connectivity services (e.g., wavelengths, CE 2.0, and IP) and orchestrated Layer 4-7 cloud services (e.g., NFV-based virtual security, etc.). MEF’s Third Network concept grew out of our experience in leading the creation of what IHS estimates is an $80 billion market for Carrier Ethernet services and technologies. The collaborative work that MEF members have put into CE specifications, operational frameworks, information models, and certification programs for services, equipment, and professionals serves as a foundation for building new, innovative services powered by LSO, SDN, and NFV. In recent years, MEF has focused on accelerating worldwide deployment and interconnection of CE 2.0 networks and strengthening CE 2.0 service assurance, scalability, and operational efficiency to pave the way for Third Network services. As of January 2017, there are now 81+ CE 2.0 certified service providers based in 29 countries, and many more are in the pipeline. Going forward, MEF’s goal is to take the huge, high growth CE services market to the next level by automating it with LSO. Development of the LSO Reference Architecture and open APIs will allow operators to overcome OSS/BSS hurdles that impede their ability to offer on-demand services and to efficiently scale those services. And LSO will allow service providers not only to orchestrate services on an end-to-end basis over their own networks built also across multiple provider networks. For orchestrated CE 2.0 services to be widely available across multiple operator networks, CE 2.0 providers must not behave as independent islands but instead be integrated into a seamless, scalable connectivity fabric cutting across geographic regions. In addition to working on LSO Open APIs for inter-carrier service orchestration, MEF has advanced important initiatives like the Ethernet Interconnection Points Project (MEF 54) to ensure alignment of service parameters and help streamline deployment of fully-featured interconnections between service providers. Although IP services are widely deployed, there currently is no standard definition of attributes used to describe them like there is with Carrier Ethernet today. This makes it difficult for IP service providers to interconnect with each other and represents a major obstacle to automating and orchestrating IP service ordering and management between providers. 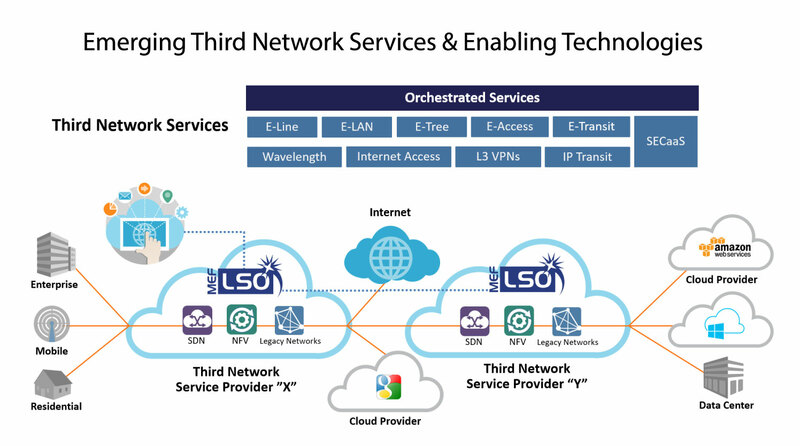 In 1Q 2016, MEF launched a major Layer 3 IP project that will create a standard set of attributes that can be used to define managed IP services delivered over multiple interconnected provider networks. Standardized IP service attributes consistent and compatible with those of globally adopted CE 2.0 services will allow service providers to leverage MEF’s LSO work to create orchestrated IP VPN, Internet access, and IP transit services. Like Layer 3 IP services, Layer 1 wavelength services are broadly available but lack standardized service attribute definitions. This makes it difficult to compare service offerings, efficiently interconnect Layer 1 operators/service providers, and achieve the goal of automating end-to-end service delivery. Current interconnection of Layer 1 service providers, for example, is done via adhoc agreements that are slow to establish and difficult to manage. In 4Q 2016, MEF launched a new project to define standardized Layer 1 services and their attributes. Upon completion of this project, MEF will be in a position to launch future projects to use those service attributes to create standard data models and open APIs. This will, among other things, enable faster Layer 1 service delivery through the automated service ordering and configuration process of LSO. In 4Q16, MEF launched new work on orchestrated cloud / virtualized NFV-based services that can be instantiated over a foundation of orchestrated connectivity services. MEF’s first project in this area is Security-as-a-Service (SECaaS). This will be followed by other projects related to Network Functions-as-a-Service (NFaaS).